PRO TESTER (16A: [SAT administrator, by trade?]) – Protester. PRO CURER (25A: [Doctor, by trade?]) – Procurer. PRO POSER (48A: [Model, by trade?]) – Proposer. PRO FILERS (57A: [Manicurists and tax preparers, by trade?]) – Profilers. “Sports will make you smarter” moment of the day: TINKER (23A: [Fiddle (with)]) – With the Chicago Cubs currently playing in the National League Championship Series, this is the perfect time to talk about one of the great Cubs players of all time. Joe TINKER was a shortstop who played professionally at the turn of the 20th century, playing mostly for the Chicago Cubs. He’s best known as being immortalized in a baseball poem by New York newspaper columnist Franklin Pierce Adams, “Baseball’s Sad Lexicon,” which lauded the double play combination of Tinker to (Johnny) Evers to (Frank) Chance and/or rued the double play combination turning a double play against the New York Giants. Tinker was a part of back-to-back World Series-winning Cubs teams in 1907 and 1908. (Yes, he was on the Cubs team that last won the World Series 108 years ago.) Tinker was inducted into the Baseball Hall of Fame in 1946, the same year as both second baseman Evers and first baseman Chance. 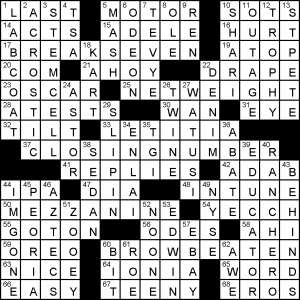 See you all a little later for the CrosSynergy/Washington Post puzzle blog. Today we get a revealer that isn’t all that revealing. Did you figure it out? 24a [*Decision in the court] SUMMARY ORDER. Maybe I’ve heard this phrase, but not very often. Holy crow! This theme took me much too long to understand. I nearly gave up, and was about to ask the Fiend braintrust for a little help. Fortunately, a few more minutes of pounding my head got the answer. 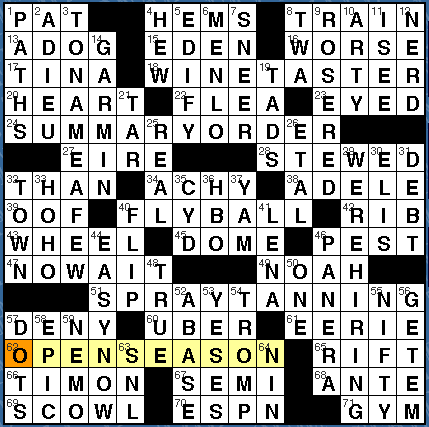 I couldn’t get past the idea that the revealer was telling me that the theme answers should precede SEASON, i.e. OPEN for SEASON (a la rabbit season, duck season, flu season, etc.). But FLY BALL SEASON didn’t work. Neither did FLY SEASON nor BALL SEASON. Finally I realized that OPEN didn’t mean precede, it meant spread apart. Each of our four main theme answers has a different SEASON spelled out at the two ends of the phrase. Too bad they couldn’t be in chronological order. SPRAY TANNING feels a bit roll-your-ownish, and I would’ve awarded more points for AUTUMN, but that’s a tall order. On the whole though, nice theme! 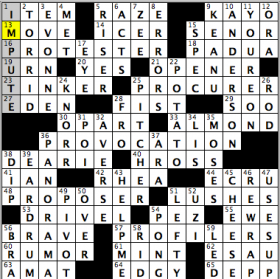 I think the revealer’s clue could be a bit clearer, but once I got it, I appreciated the thought behind it. Tricky and sneaky and clever. I like it! This looks like a debut for Mr. Caruso, but the grid certainly has Zhouqin’s fingerprints all over it with plenty of fun, clean fill such as: WE’RE HIRING, ROSE RED, and EASY NOW, TO NAME A FEW. I also like PANERA, GARMIN, “GET ‘EM!” and “NO, WAIT.” Not much to SCOWL at, either. 19a [Small fry] is plural TADS. I’m assuming this means tadpoles. I’ve never heard them called TADS. 1a [Facile] is PAT. I confess to not remembering the needed definition. Here it means ignoring complexities or superficial, as in a PAT answer. 66a [Shakespearean spendthrift] is TIMON from Timon of Athens. Completely new to me. TIMON is a generous aristocrat who gives his money away to losers who refuse to come to his aid when he is bankrupt. In return, TIMON goes to live in a cave and plots their demise. Fun stuff. In sum, really nice puzzle today from a newcomer and a veteran. 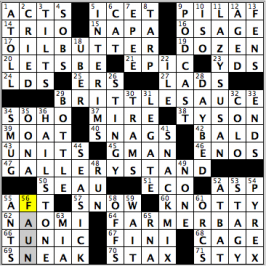 Great fill, crunchy clues, and a tricky theme. Yes, every I in the themers is a little late, changing SHARPIE PEN, LONG JOHN SILVER’S, STYLE ICON, DIAL TONES, PADDED BRASSIERE, and INNER PEACE into the wackier fill above. Thank you so much for the time, and I’ll see you all tomorrow! I like this whimsical tightness of this puzzle’s theme. The CLOSINGNUMBERs are SEVEN, EIGHT, NINE and TEN, in order. Not an obvious place to start but it works. Some numbers make up more than one word, some less. [Does well at the casino? ], BREAK-SEVEN. Why “?”? I also appreciated the big corners in the top-left and bottom-right and the simple yet elegant misdirection of [Bridge call], AHOY. This entry was posted in Daily Puzzles and tagged Anthony J. Caruso, Bruce Haight, C.C. Burnikel, Tom Pepper, Tony Orbach, Zhouqin Burnikel. Bookmark the permalink. Loved today’s NYT. Wondering if [Scrooge, by trade?] could’ve been added to the set somehow? PROMISER? Nice. How about [Nana, by trade?]? Yes, Jim! The adjective to verb flip on “open” created a wonderful AHA for a Wednesday. AV Club 8-down? I don’t get the reference; pls explain? AGERS = things that age a person. 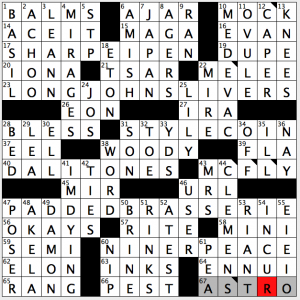 AGER(S) is not a good crossword entry, as most people rarely use or encounter the word. Those are all things that cause premature aging. Late, but. Do not get OUTAGE LAT 11D Anyone? Never mind. Got it. Just slow tonight. Nice to see a little love for the Midwest in the WSJ. Panera was founded in St. Louis, and Garmin is headquartered here in Kansas City.